The first President of Czechoslovakia, T G Masaryk, was a world-famous writer and philosopher. Thanks to his international standing and to his towering personality, Masaryk was able to put his country where it belonged on the cultural map- namely, at the heart of Europe. 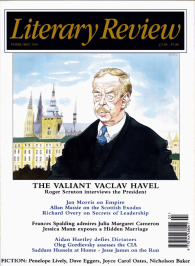 Vaclav Havel has repeated the achievement, helping the Czech experience to reassume its central place in the European imagination. His writings belong to the corpus of dissident literature, but their relevance has not dwindled since the collapse of the Communist regime. Indeed, the importance of both the plays and the essays increases, as the Communist experience fades from the European memory, and new forms of impersonal order and unaccountable government spread their shadow across our continent. Although Masaryk wrote and published freely, and received the accolades of academic, literary and political establishments, none of his writings has retained the penetrating relevance of ‘The Power of the Powerless’, of the Letters to Olga or of the intimate theatre through which Havel explored the psychological traumas of our time.